Beach usage is growing and becoming a significant part of the municipal tourism industries. Expectations of beach patrons are increasing, giving a competitive advantage to those beaches that are well maintained. 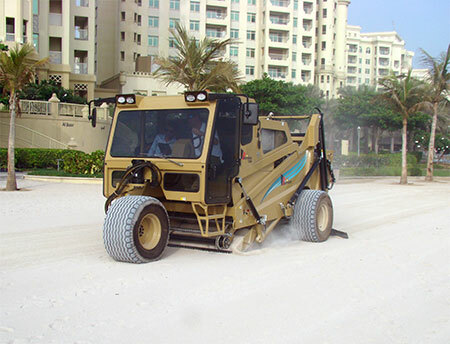 Cherrington Beach Cleaners, with their unique, powered sand screening method and design, are the most effective mechanical beach cleaners. They clean by lifting the sand from the beach, screening it through an oscillating, powered screen, and returning the sand to the beach. This screening method will remove cigarette filters, broken glass, seaweed, bottle caps, coral, shells, stones – everything bigger than the chosen screen-hole size. Most of the dangerous or unwanted debris on a beach is hidden under a layer of beach sand. Only Cherrington's Screen Clean Method truly removes all the trash and debris, and produces a beautiful and safe beach for your patrons. Our goal is to provide cost-effective solutions for beach cleaning that are versatile, dependable and low maintenance. Cherrington's self-propelled beach cleaners offer zero turn radiuses for maximum maneuverability and are easy to transport and store. The self-propelled Cherrington Models excel on large ocean beaches, and yet easily maneuver on beaches or play areas that are too narrow for tractor model beach cleaners. Cherrington Screeners are also used as rock and root pickers on landscape sites for seed bed preparation. The fine screening benefits are also appreciated on horse tracks and arenas, for small stone removal or anywhere you need to screen topsoil 4" to 6" deep. For more information, visit the Cherrington website, located at www.cherrington.net. You may also reach the company by calling 701-952-0226, or by sending email to: beaches@cherrington.net.